With our summertime haul from an excellent bookstore. Today is the first day of school in town (which seems so early! It’s still clearly summer outside), so I’m back to being primary daytime parent. Which means I’ll be doing a lot of reading. Which, okay, that in itself isn’t so different from how I spend my work time normally, but what I read is fairly different. Instead of contemporary fiction, nonfiction about violence against women or racial injustice, research papers from a variety of fields … I’ll be reading board books. Some board books are pretty good, though. Today’s post will be a paean to my current favorite, Everywhere Babies. Within the confines of the genre, Everywhere Babies is a fine piece of literature. Two glorious pages of Everywhere Babies. In some ways, it might be reminiscent of David Lancy’s The Anthropology of Childhood: Cherubs, Chattel, Changelings. And I say “might” because, uh, I haven’t read Lancy’s book; I placed a hold request at the university library as soon as I read Michael Erard’s lovely recommendation in the New York Times (“The Only Baby Book You’ll Ever Need”), but several other patrons apparently had the same idea. I sometimes gaze longingly at the online cataloge entry; it has several times cycled between “Checked Out” and “Material on Hold for a Borrower,” but that borrower has never been me. Still, the impression I got from Erard’s article is that The Anthropology of Childhood will make you feel good about your parenting decisions. Such a wide range of parenting strategies, ranging from coddling to full-on neglect, have been employed successfully in the past. Your parenting might well work too. 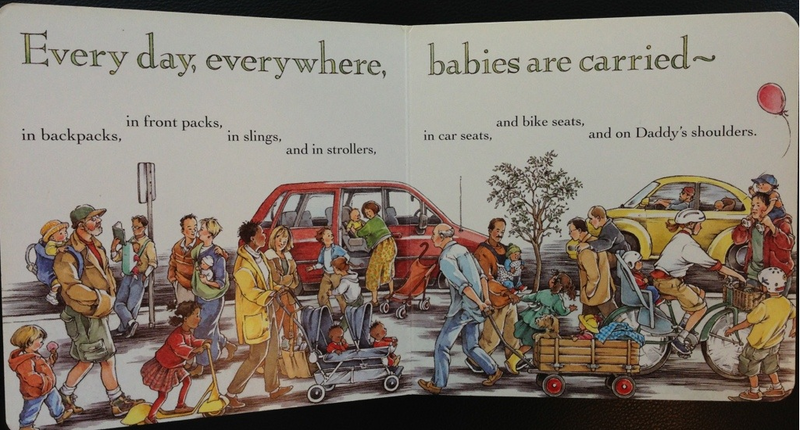 Reading Everywhere Babies conveys a similar message. Marla Frazee, the excellent illustrator, depicts a wide range of families making a wide range of parenting decisions — for instance the page “Every day, everywhere, babies are carried” shows babies transported in cars, wagons, strollers, backpacks, frontpacks, schlepped in a parent’s arms — and those decisions are all portrayed lovingly, as families trying their best. Frazee’s art suggests that whatever you’re doing is probably okay. We began reading this book to N within a week of her birth, and have read it to her at least once a week ever since, and another charming feature of Everywhere Babies is how well it depicts child development. A page about food displays baby mealtime behavior as it changes over time, and the book as a whole progresses from newborns sleeping & being carried to infants crawling, playing, & learning to walk. Despite N being our first, K and I were able to nod sagely and say, “Yeah, this is normal,” because our baby’s behavior was mirrored by one of Frazee’s illustrations. And, right, Susan Meyers‘ text is charming too — musically rhythmic, internal rhymes — very easy to read in a variety of sing-song-y cadences. 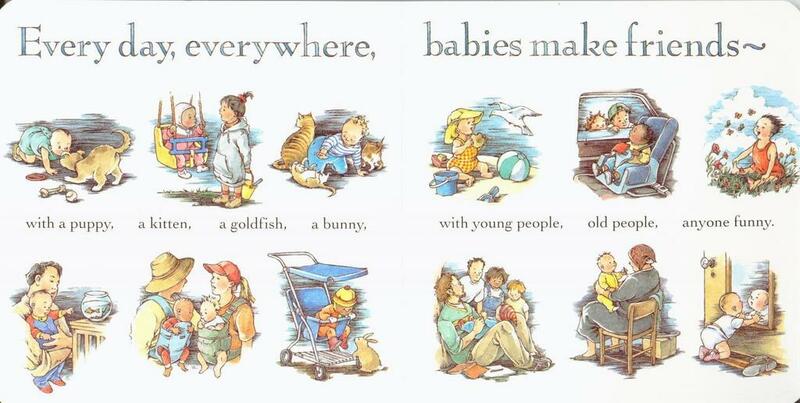 If you’re going to be having a kid, or know someone who is, you should look for Everywhere Babies. And, misnaming aside, Fuzzy Bee & Friends is such a dark book. It ends with intimations of suicide, the page “It’s such a hot and sunny day, Baby Worm just wants to play.” Baby Worm is crawling up out of the grass toward the hot sun, at which point it seems inevitable that Baby Worm will desiccate and die. That’s not the sort of thing I want to read to my daughter! Especially because my brain is wired such that it’s irresistible for me to explain the psychological implications of Baby Worm’s decisions while reading to her. 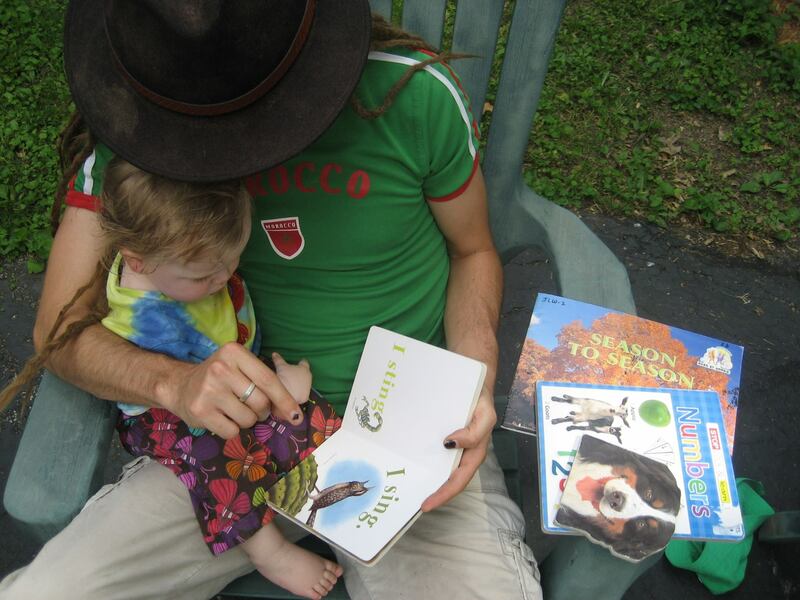 And N is a little young for this one, but I’ve loved reading Julia’s House for Lost Creatures to her. Yes, the book is about rules (at one point Julia ducks into her workshop to draw up a chore chart), but the rules are gently imposed and only upon the recipients of Julia’s bountiful generosity. The rules are well-articulated and clearly non-arbitrary; even with my rebellious streak & distaste for authority figures, I approve. Plus, Julia solves problems by writing. She has a workshop and hammers together signposts. She’s kind but firm: showers love on obsolete monsters who clearly need affection, but won’t let them take undue advantage. And all the misfits she welcomes into her home have talents that they can feel proud of (and which they employ to fulfill the tasks on Julia’s chore chart: the mermaid washes dishes, a dragon lights the fire… the troll becomes a disc jockey?). 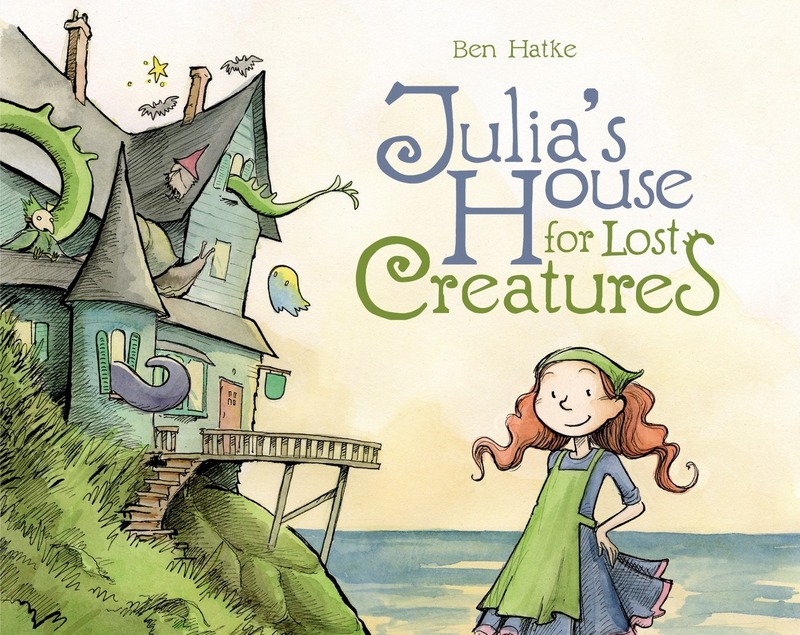 And the art is beautiful: good job, Ben Hatke. And, right, today being the first day of school means I’ll be reading all three of these today. And more! Just have to make it to 3:15 p.m.